Well as promised way back in January we have now done an official tasting of Black Bottle. You will find out many details on this particular blend on our article Blend of the Month January 2009. So came the night, Dougies wife Catherine was out on the ran dan for the whole of Saturday 7th March, so as good Samaritans and as a good neighbour we could not leave Dougie at home on a Saturday night alone. Dougie was then invited round for dinner and drinks, but Dougie said he would bring along a bottle for a tasting session, Jim did not disagree. This is when it is great to have a friend and neighbour who works away from home and regularly uses various airports around the country, as inevitably all his bottles are litre size bottles, well done Dougie. Therefore, prior to din dins we sat around the table ready for a tasting, Nicola was phoned and asked to join us, but she was otherwise engaged. 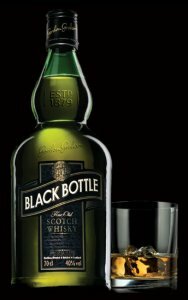 Black Bottle Blended Scotch Whisky 40% Vol/alc. The Blend with the Heart of Islay. Colour… Honey with golden highlights. Taste…Rich fruit and spice, smooth and well balanced giving way to a delightful fizzy/smokey hit. Finish…Fairly long carrying on the smoke and peat leaving one with a malty finish. Nose…Sweet with a little more than a hint of peaty/smoke. Taste…Fruity and smooth with sophisticated island notes. 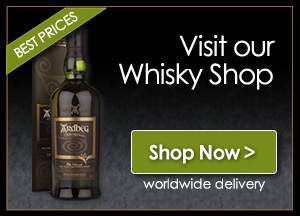 Finish…Warm with a medium length and no doubting its Islay heritage and parentage. We drank well tonight and Dougie was well impressed by this blended Whisky, saying “this has to have a regular space in my bar at home” Jim could only agree with him. When Dougie left after being well watered and fed (p.s. for Jacqueline and Catherine’s records, Dougie and Jim were good boys tonight) he made sure that the remnants in his litre bottle were taken safely back home. Pity that, it would have sat on Jim’s sideboard quite elegantly. Look around readers this blend can be found in all supermarkets as well as all Whisky shops, and can be discounted in many a place to less than £11 for a 70 cl bottle. When you go out and buy your Black Bottle in its distinctive pot-still-shaped bottle as always tell them the Whisky Boys sent you.